If you have a question or can help answer a question, please email (julie at gardenwithindoors.org.uk). I actually have no idea but I'm going to try to find out. I was thinking if was the variety that had poor performance but now I'm wondering if it's something about the flowers being yellow. Many of my bulbs seem to have shrunk this year. This one is falling into its vase. I've never noticed it so much. Will try to find out more. What can I do if the roots are growing outside the vase, outside the water? It is very tempting to push the roots back down into the water but they are, in fact, very brittle and will probably break off. If you look, like the example below, you'll see that there are lots of roots in the water so those few that are growing outwards are not essential to the bulb flowering. 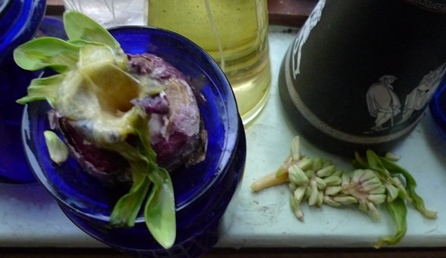 Can one tell what variety/colour of flower will be produced from examining a hyacinth bulb? I'm only familiar with two bulb colours: white/cream above and dark reddish pink of the bulbs in the bulb bowl above that. 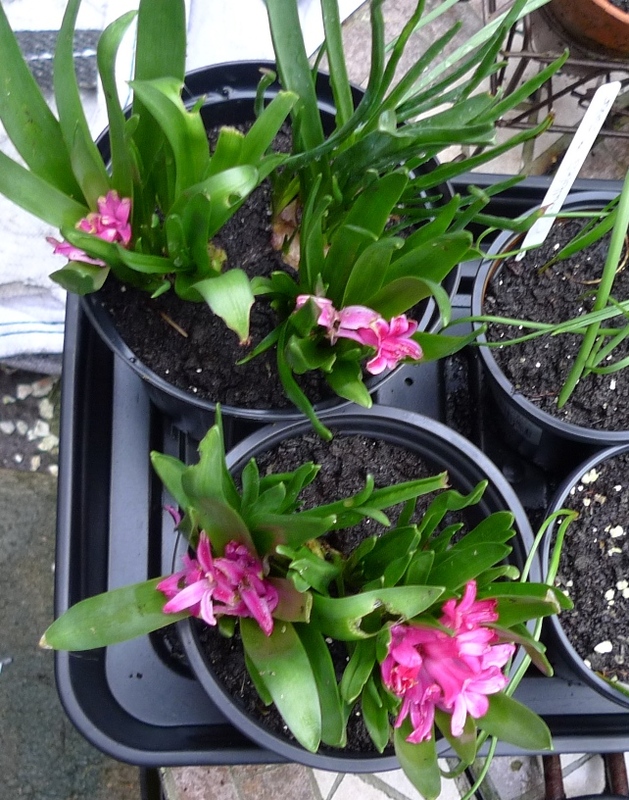 The white/cream bulbs produce white flowers (and I think the yellow varieties but will have to check my other photos to be sure) and the dark colour produces all the other hyacinth varieties (ranging from pink to dark pink to light blue to purple shades. 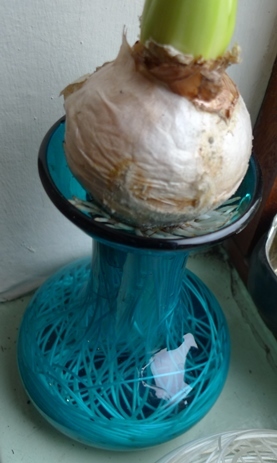 Can I take a hyacinth bulb growing in soil and put it in a vase to grow in water instead? I have been asked this a few times and have read about the Victorians doing this so I thought it was about time I tried, especially as I was recently given two empty vases. 1. I had a couple of pot-bound bulbs that needed more room so they seemed like good candidates to start with. 2. I took this one out of the pot. 3. I shook off the soil as much as possible. Inevitably a few roots broke off. 4. I rinsed off the soil as much as possible although there are still some bits of soil attached to the roots. After they've been in water for a while they may rinse off further. 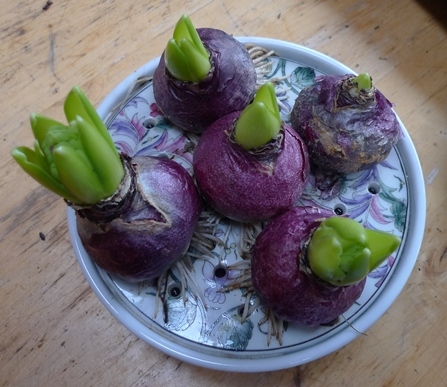 Is it too late to start hyacinth bulbs now (mid-December)? I had another vase to put a bulb in and within a few days roots were growing even though, like the bulbs below, it had the beginnings of a flower spike. So even though these were started quite late they still bloomed well even if the Delft Blue hyacinth in the green vase is one of the latest flowers. No, mid-December is not too late to start hyacinths! Why do some of my bulbs rot? I don't know. Below are the latest vases I took out of the cellar a few days ago (Dec 31st 2010) and I noticed that some of the bulbs are mouldy. That's common enough but I was wondering why - what makes one bulb go mouldy and another not. They have the same conditions so it isn't environment. I looked at vase shape but there's no correlation. 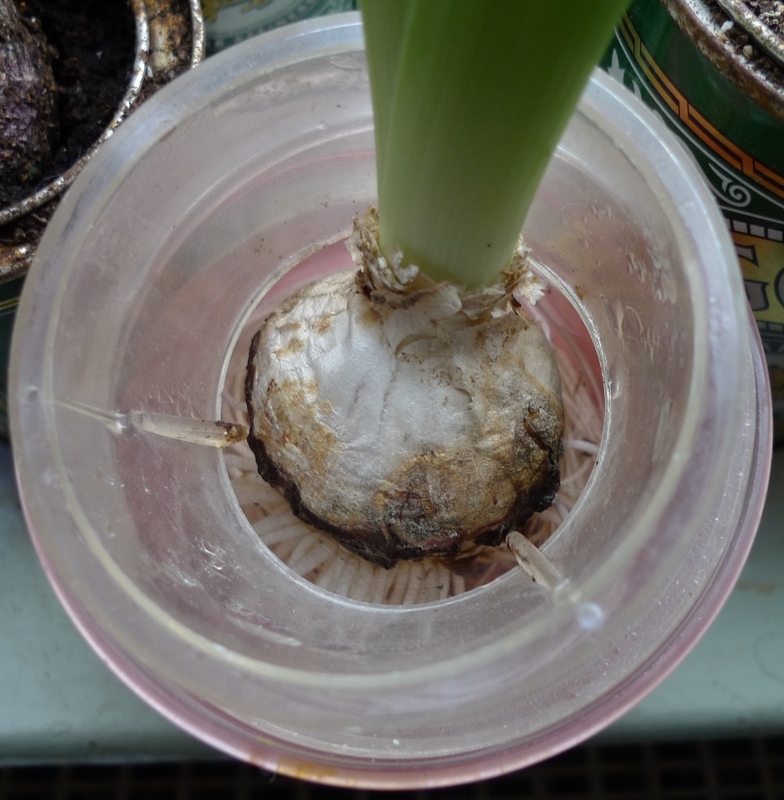 I thought maybe a bulb lower in a large cup would be more likely to grow mould but that isn't the case. The quite open cup on the vase far left is very mouldy when it has a lot of air. And some of the bulbs within cups have no mould at all. I think this set of bulbs is mouldier than others I brought up from the cellar earlier so I guess the longer in the cellar the more likely to get mouldy? 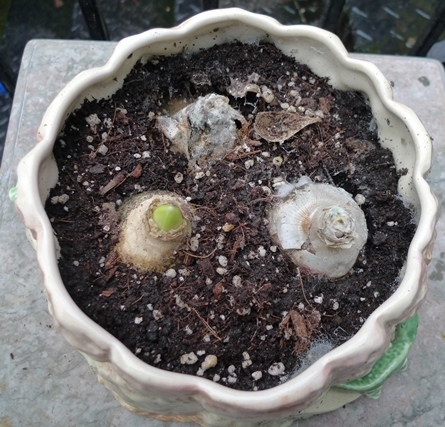 aside from the warm weather I don't know what causes this, of course there is a natural variation in bulbs so maybe its just that - a certain number of bulbs will rot each year?? What can I do about the little insects that infest my bulb pots? 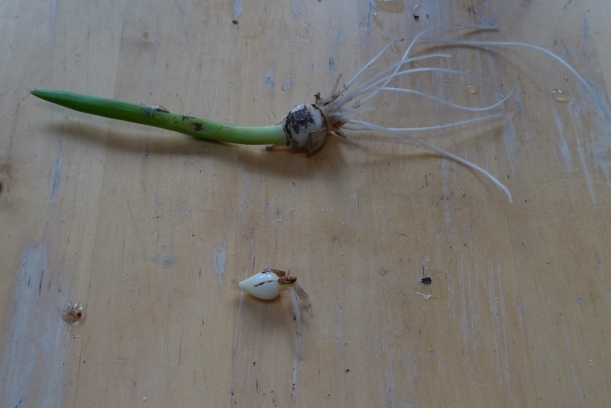 I have two types of insects infesting my bulbs in pots, those stuck on the tulip and crocus leaves, example left, and the very small flying insects in the soil of the pots. Thanks to the RHS advice line I have now found out that the white things stuck on the leaves are greenfly and the black flying insects in the soil are fungus gnats. Pesticides are required to deal with both. I won't bother with chemical controls this year as the pots will only be inside another few weeks but next year I will have one on hand to use at the first sight of the insects as the greenfly has distorted the crocus leaves and seems to have prevented some of them flowering. The fungus gnats are more annoyng than bad for the plants. Why do some of the flower stalks bend over to the side, sometimes at a right angle? I have no idea but will find out. This one is bent over 90 degrees for no apparent reason. It's not heavy and floppy, in fact, the flower stalk is quite rigid. Some that I had bent over like this straightened up as they grew. I'll see if this one ever does. I think the others straightened by the time the flowers were this open. This one never straightened up. Will the bulblets broken off from a bulb ever bloom if planted? and What is the best way to grow them? I've tried to grow the bulblets but unless they have a bit of root growth like the top example in the pic below I haven't been successful. The example at the bottom in the pic below is the type I usually have. I still don't know how to get that type of bulblet to root. I discovered this bulblet (top one below) when the main flower wilted and I removed the bulb from the vase. I hadn't even realised it what there. It has plenty of root so I'm sure it will grow well. The bottom example below I found in water in the vase when I removed the wilted flower bulb. It had broken off and fallen into the water. Again, it has some root growth so I think it will grow, but as with both of these examples, watch this space. What is the best way to clean a hyacinth vase? In my experience hyacinth vases often get cloudy with deposits as water is sitting in them for so long, for months from September to January or even longer. Often the deposits will come off with gentle rinsing and brushing (a bottle brush, left is useful for reaching the inside of the vase). For more resistant staining, denture tablets (Steardent, left, is one kind available) often work wonders. The Magic Balls (I bought these from Sarah Raven) are another option that is gentle on antique glass. A traditional method, which I have not tried yet but will, are crushed eggshells and vinegar swirled around in the vase. I have also read that rice instead of the copper balls or eggshells works as a gentle abrasive for cleaning. Please let me know if you have another method to recommend (julie at hyacinthvases.org.uk). After recent experiements with cloudy vases I can say the above methods don't really work that well or not with certain stains. I have a few vases that I have tried Steradent on at least twice and it's made no difference. Also tried Harpic tablets. I think the next step is polishing the glass. I see polishing powder being sold on ebay. I will purchase some and evaluate the results. The hyacinths will last a few weeks. At 3 weeks after Christmas half my bulbs have flowered and wilted. All these are well past their prime.To have a succession of flowers over a longer period, start bulbs off at different times, eg every 2 weeks from the beginning of September onwards. What can I do with the bulbs after the flowers have wilted? I plant my spent bulbs in the garden and they do bloom the following spring. Sometimes I don't have room in the garden and just put them in the compost pile. Or the ground is frozen and I need to wait until it warms up to plant the bulbs. The pink hyacinths below show how strong hyacinth bulbs are and how determined they are to grow. These had been dried out from a previous season and I thought I'd try to get them back to life and now they are blooming. Where can I buy prepared bulbs? and Can I prepare my own bulbs? Every garden centre sells prepared bulbs towards the end of the summer. Mail order companies sell prepared bulbs. After one year not buying my bulbs early enough and finding my local garden centre sold out I like to use a reputable mail order company so I know I can get what I want. This year (2015/2016) I have used some unprepared hyacinths, Splendid Cornelia, Miss Saigon and Peter Stuyvesant ? (mistake at the supplier means I'm not sure what they sent) as well as prepared hyacinths and they've all grown and bloomed fine. Where can I buy hyacinth vases? 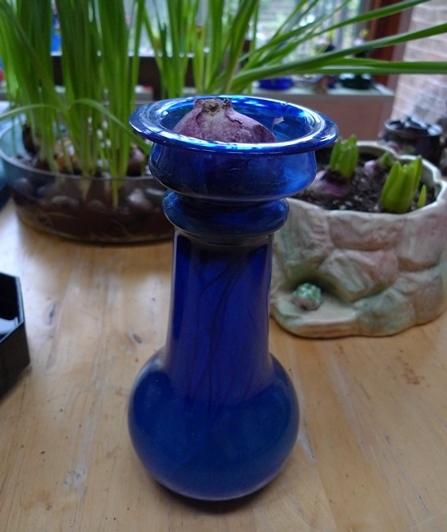 Antique shops and fairs, Portobello Rd, National Glass Fairs and ebay for antique vases. Modern vases are sold at most garden centres and many supermarkets (eg Sainsburys) and Marks and Spencer. 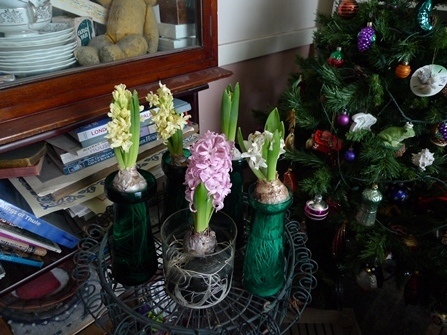 When do I need to start the bulbs if I want hyacinths in bloom for Christmas? As early as possible when you receive the bulbs in September/end of August. What varieties are best for forcing? It depends whether your priority is colour or speed. I had Ann Mary in bloom for Christmas but I don't like pink! This year I was impressed with L'Innocence (white) and Ostara (purple) although they weren't in bloom for Christmas. I don't think Woodstock is very good for forcing; having tried it the past 2 years I am not impressed with the results and won't be using it again. How much water should I put in the vase? Fill the vase up to just under the bulb. The base of the bulb musn't be in the water or it will rot. Do I need to top up the water? I've read that you should top up the water when the bulbs are in the dark but I found there was no appreciable evaporation of the water when the vases were in the cellar. What I did find was that once the vases were upstairs in a warm house, some near the radiator, the water level goes down quite quickly and needs topping up regularly. How long should I leave the bulbs in a dark cool place? About 12 to 15 weeks. I started my bulbs the first week in September and brought the first vases out of the cellar on December 7th (that was 13 weeks later) and then some vases at intervals over the following weeks as they reached the correct stage of development. As of Jan 12th I still have a few vases in the cellar some of which were recent purchases that I started much later but a couple are being extremely slow. How will I know when it's time to bring the vases into the light? The bulge of the flower must be out of the bulb before it is brought into the light. The bulbs below (pic taken in November) need longer in the dark. Why do some bulbs partially flower while still in the bulb? This can happen if the bulbs are brought into the light before they are ready but that wasn't the case with this example as the flower spike was tall enough so the simple answer is I don't know. When I lifted this bulb I saw that the roots were rotten so maybe that caused the flower problem but I don't know what caused the rotting roots in the first place. 8% of my bulbs did not flower properly (5 out of 60). I suspect this is just a level of bulb failure that is inevitable. 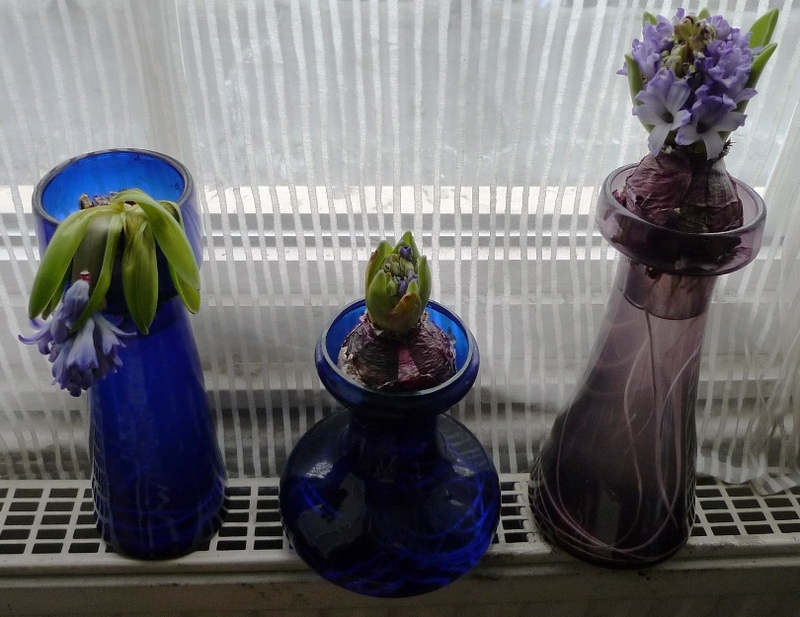 Do I need to use a hyacinth vase to force hyacinths? You can use anything that holds the bulb above water. The 3 vases on the right were not made as "hyacinth vases" but they do the job. The tall blue one on the left has a small cup though and if you only have very large bulbs one will not fit in it.And of course pots with soil/bulb fibre are fine for growing hyacinths. Many containers can also be improvised. I used the basket, below, lining it with plastic from a cut up rubble sack (bit thicker than a bin liner) and as it wasn't very deep I put some pebbles in the bottom to ensure the roots had something to anchor on. See the photo below that to see how well the hyacinths grew in it. Can I force other bulbs in water? Yes! Hyacinth, amaryllis, crocus and tulip bulbs all grow in water-filled vases with the bulbs sitting in some sort of cup at the top of the vase, allowing their roots to grow into the water. 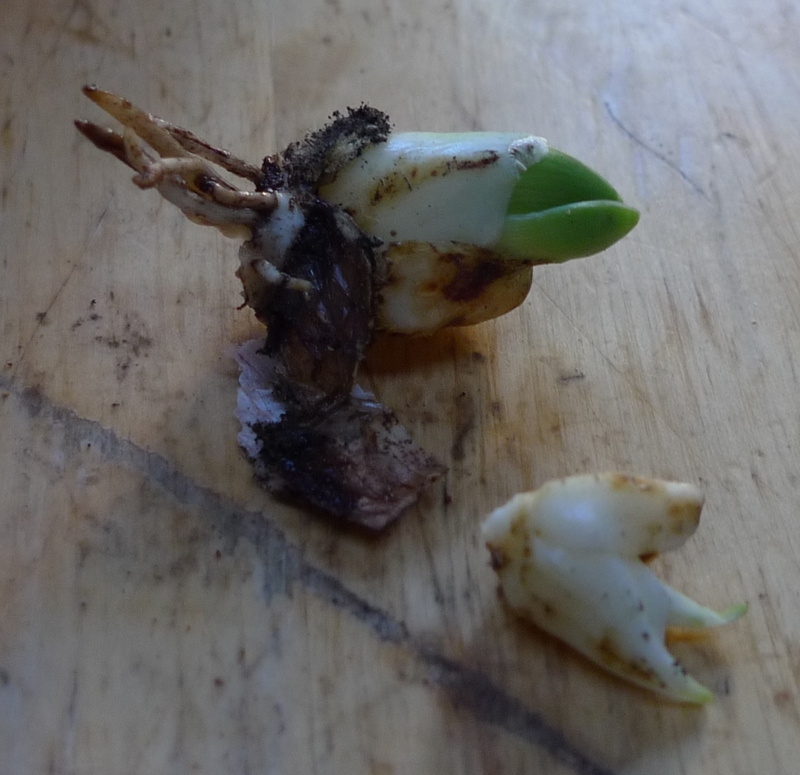 Some of my forced crocus rotted from the bottom. What causes it? I don't know. As it's happening at the bottom it seems rather curious. Will research it. How much is my vase worth? It depends. They can be from 10p for a modern vase at a charity shop to almost £300 for the rare vintage vases. See the ebay Price Guide for more info.